During the cold season, every driver faces with this problem: windscreen demisting. Every mechanic will tell you to change the pollen filter or to clean the AC. Or, you will buy different solutions to solve this problem. 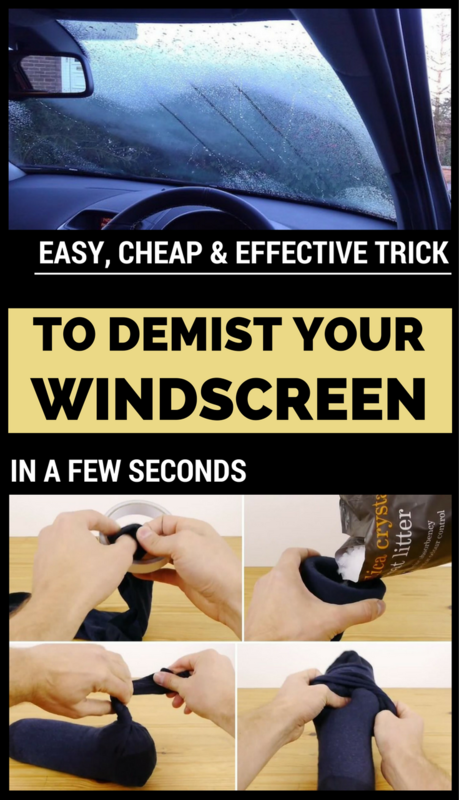 But there are also simple tricks that drivers have learned from their own experience to demist their windscreens. The good news is that they work like magic! You only need an old pair of socks and some hygienic sand for cat’s liter. And the other great news is the low costs it has. All that you have to do is to put the sand granules into each sock, and then put the socks on the car’s board, near to the windshield or under the car seats. Easily, it will absorb all the moisture from your car and in just a few days you will discover the difference. The windscreens won’t mist again. Sand has the power to absorb moisture from the air, and the result is guaranteed. Keep your car windows clean all the time, because a dirty window is more prone to misting than a clean one. You can clean them weekly with a solution made from 3 parts of apple cider vinegar and 1 part of water.